In our last blog, we discussed some joint pain power foods that can help prevent and reduce joint pain. 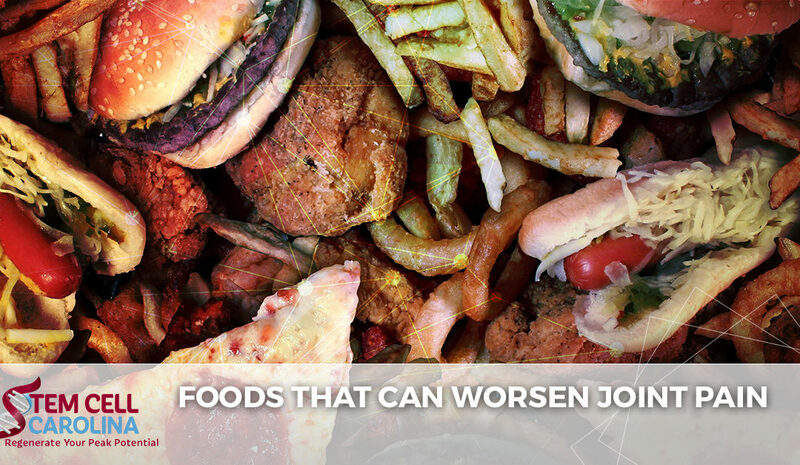 We also briefly touched on those foods that can aggravate your joint pain. In this blog, we will discuss some foods that can negatively impact your joint pain and cause more misery. There are several foods that can worsen your current joint pain or can contribute to developing joint pain. If you suffer from any type of joint pain, namely rheumatoid arthritis, keep this list handy and live a more comfortable life! Resist a sweet treat if you suffer from joint pain or arthritis! Processed sugars such as corn syrup, fructose, sucrose, or maltose, can cause you to suffer from more joint pain. Sugar triggers the release of cytokines which are inflammatory messengers. These cytokines contribute to inflammation and swelling that causes joint pain. Processed and pre-packaged foods contain all sorts of things that help to preserve them. These preservatives trigger systemic (widespread) inflammation in the body. This manifests as bloating and joint pain, among other uncomfortable side effects including digestive discomfort. If you must consume pre-packaged or processed foods, check the label to avoid trans fats and partially hydrogenated oils. Not all fats are bad and should be avoided, and some fats are actually healthy and should be consumed. However, there are a great deal of bad fats that should be avoided like the plague. Avoiding bad fats such as fatty cheeses, butter, margarine, mayonnaise, shortening, and grease (yes, like what foods are deep-fried in!) can help reduce joint pain in a few different ways. One, these fats actually cause swelling and inflammation in the body as a whole which can directly impact your joints and cause pain. Two, they all cause weight gain which puts additional strain and pressure on your joints which can lead to pain in otherwise healthy joints. And, three, they contain advanced glycation end products (AGEs) which actually break down the body’s healthy cells, contributing to widespread discomfort. Gluten, which is a protein that is found in some grains, causes inflammation in some people. While many people who suffer from gluten-induced inflammation experience symptoms in their digestive system, joints are impacted similarly. For those who suffer from autoimmune disorders including rheumatoid arthritis and celiac disease, the inflammatory effects are often much worse. Red meats are high in saturated fats and AGEs that contribute to inflammation in various places in the body, including the joints and circulatory system. Avoid red meat if you already suffer from chronic joint pain and consider reducing your red meat intake to prevent arthritis. Refined carbohydrates include white flour products, white rice, and white potatoes that have all been processed or refined. These foods include most bakery breads, crackers, instant potatoes, french fries, and cereals. Refined carbohydrates contain high levels of AGEs and trigger widespread inflammation in the body. Additionally, these goods contribute to weight gain that puts additional stress and pressure on joints. MSG — mono-sodium glutamate — is a flavor enhancer that is used in soy sauce, premixed soups, salad dressing, deli meats, and fast food. MSG works directly on inflammation pathways in the body to stimulate widespread inflammation and swelling throughout the body, including the joints. Salt causes inflammation in the body in different ways than the other products already listed. Rather than causing joint inflammation, salt causes the body to retain fluid and cells to expand. This excess fluid buildup can affect the joints and cause painful swelling. Avoid foods that are high in sodium and limit the amount of table salt you add to foods. The verdict is still out on alcohol and the effects of alcohol on joint pain and inflammation. For instance, a review of studies showed that women who drank more than three glasses of alcohol a week had half the risk of developing rheumatoid arthritis than women who abstained from drinking. However, those who consumed more than one drink a day had an increased risk due to a spike in CRP levels. As with many other things, alcohol should be consumed in moderation and overconsumption should be avoided. Additionally, alcohols that are heavy in processed sugar should be avoided altogether. 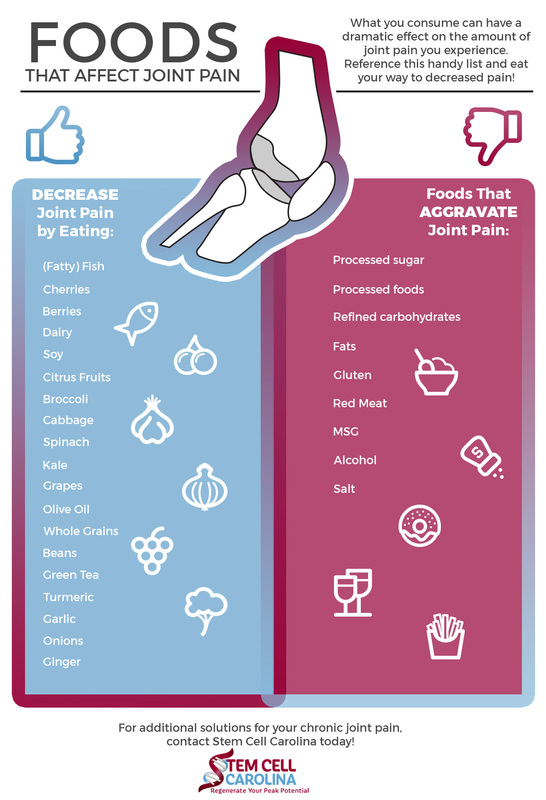 If you suffer from chronic joint pain, you can find some relief just by changing your diet. While a modified diet cannot cure chronic disease such as rheumatoid arthritis, nor can it reverse the joint damage caused by injury, it can limit swelling and inflammation and result in reduced joint pain. For additional solutions for your joint pain, contact the joint pain experts at Stem Cell Carolina to schedule your consultation.